*FDA Disclaimer: Claims based on traditional homeopathic practice, not accepted medical evidence. Not FDA evaluated. Individual results may vary. Get Relief with Eye Floaters Relief®. Eye Floaters Relief® Eye Drops is a homeopathic eye drop designed to be used on an as needed basis to provide temporary relief for symptoms such as shapes and squiggly lines in vision, floaters, dark-dots, and dust particles in your vision. Eye Floaters Relief® is safe and gentle to use, with no known side effects, interactions with other medications, or contraindications. Each bottle is 10 mL (0.33 fl oz). Use 1-2 drops, 3 times a day or as needed. Eye floaters are small spots that appear in your vision as black or grey strings, squiggly lines, cobwebs, or specks that can appear almost “see-through”. They can appear to be drifting across your field of vision, and often move out of sight when you make an effort to focus on them. They can be seen most easily when your eyes are focused on a bright, plain background such as a piece of paper of a blue sky. The most common cause of floaters is the aging and deterioration of the vitreous. The vitreous is a gel-like substance that makes up most of your eye. As we age, this substance becomes more liquefied. During this process, it is common for the microscopic protein fibers that make up the vitreous to clump together- casting tiny shadows on your retina. The shadows we see are called floaters. These changes to your eye can happen at any age, but more commonly affect those between 50 and 75. While floaters are usually caused by the natural aging of the eye, there are some other conditions that may cause eye floaters. These conditions include inflammation in the back of the eye, bleeding in the eye, a torn retina, eye disease, an injury to eye, eye surgery, or an eye tumor. For these reasons, we always recommend consulting your doctor or physician if you are experiencing an increase in eye floaters, an onset of new eye floaters, darkness in vision, peripheral vision loss, flashes of light in your eye, or eye pain. Risk factors that may increase your chance of floaters include bring over 50 years of age, nearsightedness, eye trauma, complications from cataract surgery, and diabetic retinopathy. 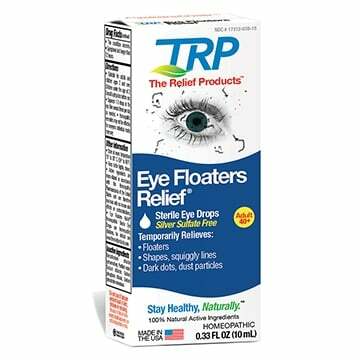 What is Eye Floaters Relief®? Eye Floaters Relief® is a homeopathic eye drop designed to be used on an as needed basis to provide temporary relief for symptoms such as shapes and squiggly lines in vision, floaters, dark-dots, and dust particles in your vision. Eye Floaters Relief® is safe and gentle to use, with no known side effects, interactions with other medications, or contraindications. “HPUS” indicates the active ingredients of this product are officially monographed in the Homeopathic Pharmacopoeia of the United States. Suitable for adults and children ages 2 and over. Children under the age of 2: Consult a physician before use. Squeeze 1-3 drops in the eye. Use several times per day as needed. Homeopathic remedies may not be effective for everyone. Individual results may vary. A PHYSICIAN SHOULD ALWAYS BE CONSULTED TO RULE OUT SERIOUS CAUSES. This product is intended to complement, not replace standard medical treatment. Initial worsening of symptoms may occur. Contact lens wearers: Consult a physician prior to using. To avoid contamination – do not touch tip to any surface. Replace cap after every use. • Use within 30 days of opening. EXPIRATION DATE ONLY REFERS TO THE UNOPENED BOTTLE. Solution changes color or becomes cloudy. You frequently contract infections that do not clear up easily. You experience eye pain or changes in vision. You experience eye pain, changes in vision, continued redness or irritation of the eye. Symptoms last longer than 72 hours. Non-prescription drug products cannot treat infections. Active ingredients are micro-diluted in accordance with the Homeopathic Pharmacopoeia of the United States and are therefore non-toxic with no known side effects or contraindications. Q: What are eye floaters? Answer: As we age, our bodies start to wear down a bit – and the same is true for our eyes. Aging eyes may suffer from cloudy particles, dots, specs and squiggles, blurry vision, or tiredness, among other symptoms. Everyone suffers from these symptoms as they age. Q: What is Eye Floaters Relief®? Answer: Eye Floaters Relief® is a homeopathic eye drop, designed to be used with adult eye supplements. Eye Floaters Relief®provides temporary relief for symptoms such as floaters, opacities, blurry vision, dry, red eyes, tired eyes, cloudy vision, difficulty reading, and poor night vision. Eye Floaters Relief® also provides corneal health and macular health support. Eye Floaters Relief® is safe and gentle to use, with no side effects, interactions with other medications, or contraindications. Q: How does Eye Floaters Relief® work? Answer: Eye Floaters Relief® works via the traditional homeopathic mode of action, which is that it utilizes small amounts (micro-dilutions) of ingredients that would cause, in a large dose, aging eye symptoms. These ingredients, in a micro-dilution, gently stimulate the immune system to respond to these symptoms. Q: Should I see a doctor? Answer: Aging eye symptoms should always be diagnosed by a doctor to insure that the most appropriate treatment or treatments are prescribed, and that the condition is properly monitored. Q: How long should I use Eye Floaters Relief® before getting relief? Answer: Every individual is different, and since the homeopathic active ingredients are stimulating the body’s response, results will vary from person to person. It may take up to 60 days for full relief. While a great number of people have found relief with our products, they do not work for everyone. For that reason, we have the 60 Day Money Back Guarantee. Q: What adverse reactions, drug interactions, contra-indications, or possible complications are there? Answer: Homeopathic remedies have a 200 year history of having no known adverse reactions or drug interactions. They are okay for adults and children over the age of 12. Use only after diagnosis by a physician; who should always be consulted to rule out serious causes. Initial worsening of symptoms may occur, a situation known by homeopathic doctors as a healing aggravation. If this occurs, discontinue use until symptoms subside, then resume use.